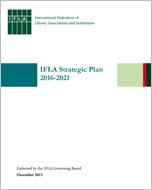 This strategic plan sets out IFLA's strategic directions and goals for 2016-2021. It aims to guide the governance and activities of the IFLA organisation. The Key Initiatives and their Activities will be driven by IFLA’s Governing Board through advisory and steering groups comprised of representatives within our membership, professional units, policy and programme advisory bodies, regional offices and language centres, and partners, working closely with expert IFLA staff. IFLA’s professional units will capitalise on their expertise to undertake additional projects that support the Key Initiatives. IFLA’s strategic directions are supported by strong governance, evidence-based practice and research, and robust policies and standards. The Strategic Plan is available in English in a web version that includes regular updates on key actions and also as the original version for download in PDF in all seven IFLA languages.